All of the flavours of pumpkin pie in French toast form that goes really well smothered in maple syrup. Mix the eggs, milk, pumpkin puree, vanilla, cinnamon, ginger, cloves, nutmeg and brown sugar in low flat bowl for easy dipping. Dip the bread into the egg mixture on both sides and grill in a pan until lightly golden brown, about 2-3 minute per side. I can imagine how lovely flavours this French toast had. I made it for the first time a few days ago with apples. Nice! Guaranteed to be a good one! So delicious! A terrific idea! Pumpkin Pie French TOAST?!?!?! This sounds incredible. I'm collecting some things to make when my mom is here for the holidays. I have to make this one. Darn, I just ate the last of my pumpkin bread. I wish I had some left to make french toast. I have made pumpkin french toast before and it is delicious! Yours looks beautiful. I've made pumpkin pancakes but never french toast. The picture is fabulous! Great idea. I like the cute little pumpkin in the back. YUM! I love anything pumpkin! Oh man Kevin. I hope my husband doesn't hear about pumpkin French toast or I'll have to make it for breakfast every single day. This does look amazing, though. I've tried a similar technique using bananas. I definitely have to try pumpkin now. Oooh! I'm usually not a huge fan of french toast, but this looks delicious! And you're right! It's a great way to use up pumpkin post-holiday! What a great way to make french toast! Love it! This sounds like a delicious way to enjoy pumpkin…I've been looking for something beyond pumpkin pie – thanks! This looks really good – great for this time of year! Oh my! Have to try this. Really does sound delicious – like a no brainer why didn't I think of that before kinda thing. I feel like a 'Hobbit'…3 breakfasts today, and now I'm sallivating over pumpkin french toast !!!!!! It's 11PM daggummit. Now I'll NEVER sleep. Kevin You Rock….keep on cooking Mister, the foodies out here are eatin' it up ! I'm especially all in on the side of crumbs….what a perfect compliment to this delicious recipe! Well now isn't that a fun idea? fantastic!! i love this idea! I really want to make this for dinner tonight. Is that weird? I was just thinking about making this, haha! Great picture. 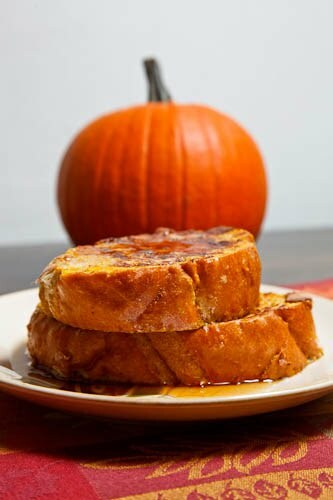 I'm loving the pumpkin french toast! what a great idea to use up all the extra! Kevin, this looks so good. Thanks for the ideas! I love this twist on french toast! Apparently I can't help myself … I get sucked in so easily when I see a new way of using pumpkin puree! This would be great for my next weekend brunch. I never have any pumpkin leftover, but I'll have to remedy that [G]. This looks too good to pass up. You had me at hello… Just listen to those fabulous flavours together!! I liked the recipe of "Pumpkin Pie French Toast" and thanks for adding new one to my options for Sunday menu list. I just worry about the nutrient value of this dish. Hope to see more. Oh, yes please! I'm not even a big french toast fan. I'm more of a pancake fan, but I have to try these! Tried this this morning, it was great – thanks. Yum, Yum, Yum!!!!! I made this for breakfast today and this has become my new favorite fall breakfast. It tastes just like pumpkin pie, and that, to me, is perfection. Made it this morning. Definite win! Pure genius! I just made them & they were fantastic! It was a big hit with the whole family. I made a double batch and some of the batter left over. I added a little more egg and baked it in a water bath in the oven. Delicious. This was very sweet french toast, so instead of syrup, I ate it with a schmeer of greek yogurt on top. Found this recipe on your blog through Pinterest. Looks amazing! Pretty soon the pumpkins will be here and I will enjoy making these again! Well done!!! I made this for breakfast today and my family LOVED it. Thanks! Can't wait to make this soon with fresh pumpkin puree!! It looks so good! Made this for breakfast today and wow! I loved it and even my pumpkin refusing husband had two pieces…do you have any idea how many calories are in each slice? I had some cinnamon bread I had to use up and some pumpkin puree left over from a cookie recipe I made last night so i popped onto Pinterest, found your recipe and I made your Pumpkin French Toast this morning and it was a HIT! Thanks for the inspiration! You made our tummies happy! I made breakfast for dinner tonight and we had your pumpkin french toast. It was wonderful! So yummy! Just made it. It was so delicious. The best French Toast recipe ever! Thank you!! made this this morning and YUM!! thanks for sharing! What a long line of pumpkin lovers we are. Thanks so much for what looks to be an outrageous French Toast.Will make it this weekend !!!!! Looks to be an outrageous recipie. Will have to make it this weekend. Hope all of you pumpkin lovers enjoy as well. I make home made pumpkin pies every year, but the thing to remember when using a Halloween pumpkin is that if you burn a candle in it..you will taste that in your recipe. I just buy an extra pumpkin for cooking purposes or put one of those little fake tea lights inside. I made this last weekend with homemade pumpkin bread and it was amazing! The pumpkin bread itself didn't really have a strong pumpkin flavour, but the flavour of the french toast was very pumpkin pie! I'm sure it would have been just as great with regular bread. This looks AWESOME. I would like to make this for a brunch party of about 25 people. Do you think it will be just as good made an hour or so earlier and put in a chafing dish heated by sterno? I'm worried that it will get "soggy"??? Anonymous: I have not tried it but that should work. It will not be as good as fresh but it should not be soggy. is this receipe for 4 pieces of bread? Anonymous: The recipe calls for 8, 1 inch thick, slices of bread but you can cut it down to 4 if you prefer. Delicioso, a mi hijo le encantó! Gracias por compartir.